It’s that moment when you sit down to dinner, look at your plate and get extremely excited to eat your very own catch of the day. That’s right, there’s nothing like ocean to table dining and at Anglers Adventures & Outfitters we can make that happen for you. 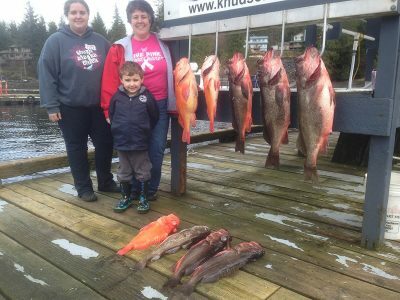 Offering fishing charters in Ketchikan, Alaska, Angler’s Adventures & Outfitters always offers a good time out on the Alaskan waters. At Anglers Adventures & Outfitters, we have seen all types of people board our boat nervous and by the end of it, they go home smiling. Whether you are a seasoned angler or this is your first time ever stepping foot on a boat, Anglers Adventures & Outfitters welcomes you with open arms. Our family friendly fishing charter is the perfect experience for both the young and old, and the novice to expert. Your captain and the owner of Anglers Adventures & Outfitters, Brian Ringeisen, has over 26 years of guiding experience in the Alaskan waters and will tailor your charter based on everyone’s personal needs. Bringing a smile and open attitude is all that you need. What’s Included in the Charter? Speaking of all you need, we handle everything at Anglers Adventures & Outfitters. Not only do you get an experienced captain and instructor, we also provide all of the gear you could possibly need. This includes rain gear. Whether you are netting some crabs or fishing for the King Salmon, all of the bait, tackle and lures are provided. We also have fishing licenses and stamps available for sale on the boat. Our boat, the Sierra Dawn, is a 28’ Bayliner Trophy that is equipped with all the latest electronics and gadgets that help make fishing a whole lot easier and more comfortable for our guests. The boat also has an enclosed, heated cabin with a private bathroom. Every charter we do can be tailored to your liking. We offer half, full and multi-day excursions for those that really want to explore that Alaskan ocean. Our custom charters can take you on a wild King Salmon fishing adventure. We can explore nature and possibly view whales on our way out to go catch some Halibut. Whatever your fishing and Alaskan desires may be, this charter does its best to deliver results for you. 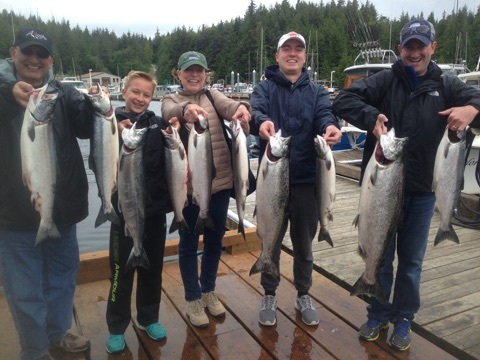 If you are interested in learning more about a charter fishing trip in Ketchikan, Alaska, call us for more information, and book your next charter at Anglers Adventures & Outfitters. The fun awaits you! Contact us today at 907-254-0800 or send us an email at brian@anglers-adventures.com.